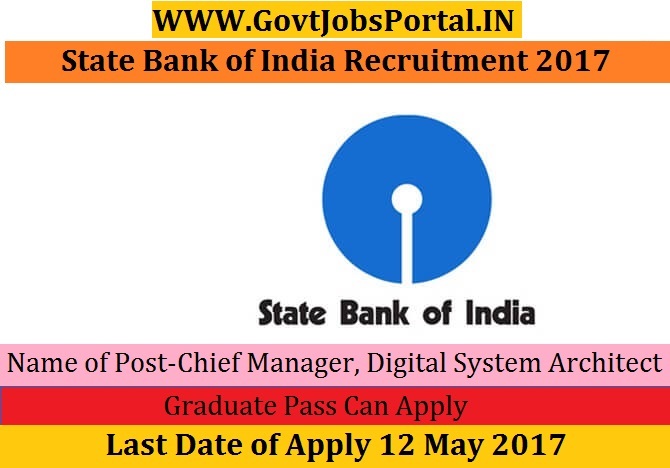 State Bank of India is going to recruit fresher candidates in India for Chief Manager, Digital System Architect Posts. So, those candidates who are willing to work with this organization they May apply for this post. Last Date of Apply 12-May-2017. Total numbers of vacancies are 12Posts. Only those candidates are eligible who have passed Engineering Graduate in Computer Science/ Information Technology / Electronics or MCA/MSc (IT) / Msc (Computer Science) with first class grade from Govt Recognized University / Institute with 5 years of experience in Architecture of web and mobile applications. Good knowledge of applications and infrastructure. Indian citizen having age in between 20 to 40 years can apply for this State Bank of India Recruitment 2017. Educational Criteria: Only those candidates are eligible who have passed Engineering Graduate in Computer Science/ Information Technology / Electronics or MCA/MSc (IT) / Msc (Computer Science) with first class grade from Govt Recognized University / Institute with 5 years of experience in Architecture of web and mobile applications. Good knowledge of applications and infrastructure.